I know political posts can be divisive but I must comment on the Women's March this past weekend. It was so heart -warming to see people from all walks of life stand up together against hateful rhetoric. It was truly remarkable to see Marches in every American state and international countries including Canada (where I reside). While there were many (very valid) critiques of the March, I believe at its core, the March represented solidarity, resistance to hatred and that change is in the hands of the people! I believe whole-heartedly in inclusiveness and best chances for all, and I sincerely hope that the March is just the beginning of a world with both. We're well into Winter and with the sun going down so early these days - I'm always ready to turn in with a great book. I have a huge pile of books on my nightstand waiting to be read! Last year I challenged myself to read 30 books, and I only got about halfway to my goal before completely giving up. This year I've reset my goal to 30 books and hope to complete it this year. There are a lot of great books being released this year so I'm definitely looking forward to that. I put together a short list of books I'm currently reading and will read in the near future! To keep up with my reading challenge, follow me on Goodreads! 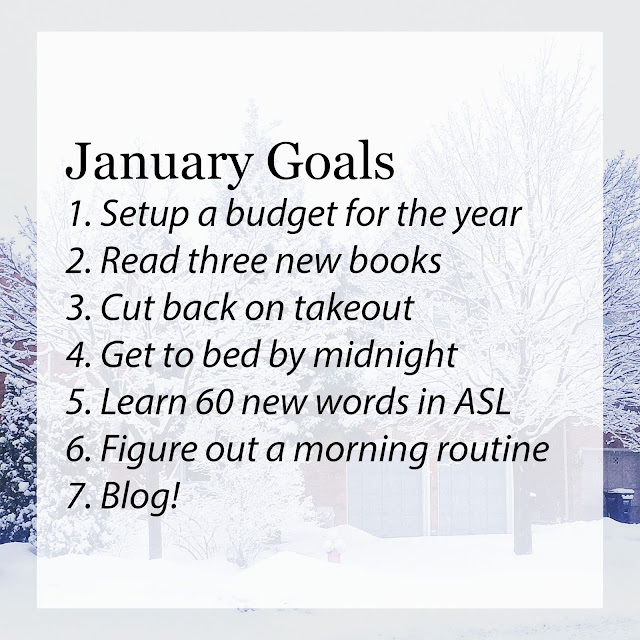 I'm trying something new and setting little monthly goals for the duration of the year. Each month I'll check in with the previous month's goals and set some new ones. January is generally a rough month because it's so freezing cold, the holiday magic is gone and the reality of the daily grind sets in. This month I set up some fun (in my opinion) goals for myself. Things I know I can realistically complete before I start challenging myself for the rest of the year. I'm pretty excited to get started with everything this month! What goals have you set to get yourself going for 2017?